If you have a peach or nectarine tree you may have a tree with leaves that look like mine. I was hoping this year would be a “good” year and I wouldn't see this on my trees, especially since I didn't apply any dormant sprays this year, but no such luck. Peach leaf curl, also known as leaf curl, is a disease caused by the fungus Taphrina deformans. 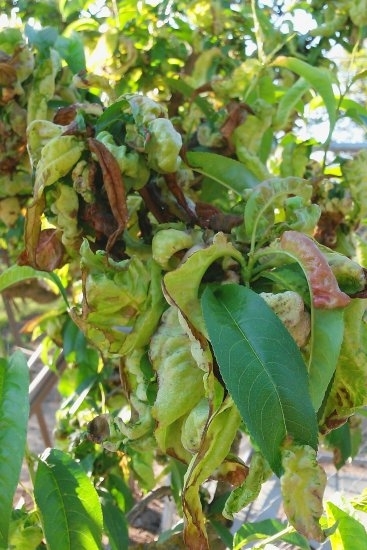 Peach leaf curl affects the blossoms, fruit, leaves, and shoots of peaches, ornamental flowering peaches, and nectarines, and is one of the most common disease problems for backyard gardeners growing these trees. Unfortunately there is nothing that you can do now to treat or correct this problem. Peach leaf curl first appears in spring as reddish areas on developing leaves. These areas become thickened and puckered, causing leaves to curl and severely distort. The thickened areas turn yellowish and then grayish white, as velvety spores are produced on the surface by the leaf curl fungus. Later affected leaves turn yellow or brown and can remain on the tree or may fall off; they are replaced by a second set of leaves that develop more normally unless wet weather continues. The loss of leaves and the production of a second set result in decreased tree growth and fruit production. Defoliation in spring may expose branches to sunburn injury. Periods of cool, wet weather, when leaves are first opening on the tree, favor the disease. To prevent peach leaf curl, use resistant peach and nectarine varieties where possible. (See the Resistant Varieties section by clicking on the link below.) For nonresistant varieties, treat trees with a fungicide every year after leaves have fallen. In cooler northern locations leaf fall usually is in late November. Generally a single early treatment when the tree is dormant is effective, although in areas of high rainfall or during a particularly wet winter, it might be advisable to apply a second spray late in the dormant season, preferably as flower buds begin to swell but before green leaf tips are first visible. For more information on Peach Leaf Curl, click here.